Built shortly after the Ohio Soldiers’ and Sailors’ Home (now the Ohio Veterans Home) opened in 1888, this library building served the Home for many years. Residents of the Home could read books and magazines in the Library. A picture of the Library appeared in the book Art Work of Huron and Erie Counties in the 1890s. 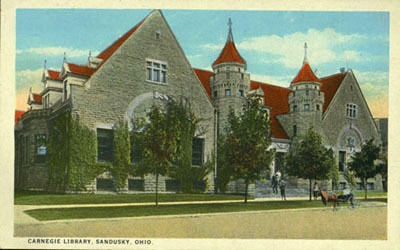 A large assembly hall, often called “Library Hall” was on the upper level of the library, which was used for meetings and card parties. The McMeens Post No. 19, Grand Army of the Republic, an organization of Civil War Veterans, often held its meetings there. During World War II, the U.S. Civil Air Patrol held drills in Library Hall. Sometimes church services were held in the building. 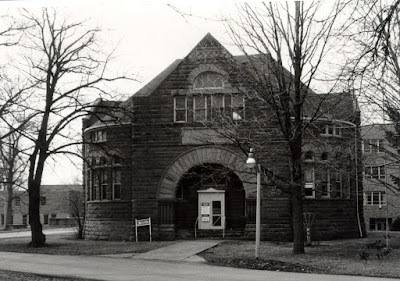 This picture of the Library was taken in 1983. 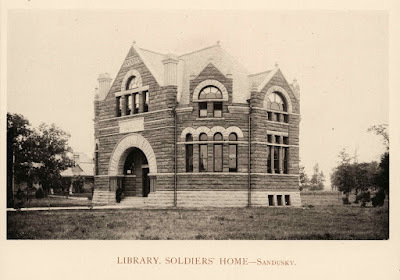 A series of twenty photographs of the Library at the Ohio Soldiers’ and Sailors’ Home is found in the Prints and Photographs Collection of the Library of Congress Online Catalog. These views give a detailed view of each floor of the Library, as well as several exterior views. By 1988, this building was no longer used as a Library. It was demolished, along with several other buildings on the grounds of the Ohio Veterans Home, because it would have been too costly to make the improvements that would have been necessary were the buildings to remain in use. 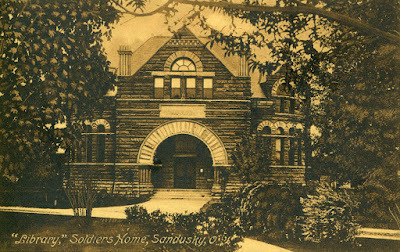 Today a research library is housed in the Military Museum at the Ohio Veterans Home. The library is available for use by Ohio Veterans Home residents as well as the general public. how unfortunate that so many of the buildings at the veterans home were destroyed instead of preserved. they could have been used as a museum attraction, showcasing war memoribilia and teaching people about the lives of our soldiers in all aspects of military experiences.